Let your imagination walk from the front door, onto the large back yard and terrace. This one-of-a-kind home is designed around a 2-story center courtyard featuring a miniature rain forest situated under a dramatic staircase in the foyer area. A step beyond opens up to cathedral ceilings, custom tilework throughout, an expansive view of our backyard garden and of course - Corcega Beach! The huge kitchen features every modern appliance, and joins with the large dining area and an inviting, fully furnished terrace (great shade and plenty of room for playing cards, puzzles, games, conversation). Cool off in our Japanese sitting pond in the back garden area, just off the terrace. The master bedroom has a four-post king size bed and oversize tiled shower, which links to a second story terrace perfect for coffee, conversation and stargazing at night. Each additional bedroom has its own tiled shower (guests value this greatly). Each bedroom also has individual A/C controls. This is a gated property. You'll feel very comfortable with the family-sharing options and private areas in this house! Our Guest Book (on the premises) is chock full of nice commentary, good experiences and excursion recommendations. You'll enjoy reading it! We're proud of our Rincon home, and invite you to make memories here. english, spanish, House manager Francisco Martinez speaks both. We custom-built this home for our large family in 1997. Since then, our four children have blessed us with seven grandsons - and finally one granddaughter so you can certainly imagine the memories we create, and the relaxation our house encourages. We designed and built this distinctive home, and we're happy to share it with guests who value beachfront tranquility, all the amenities and sightseeing options. 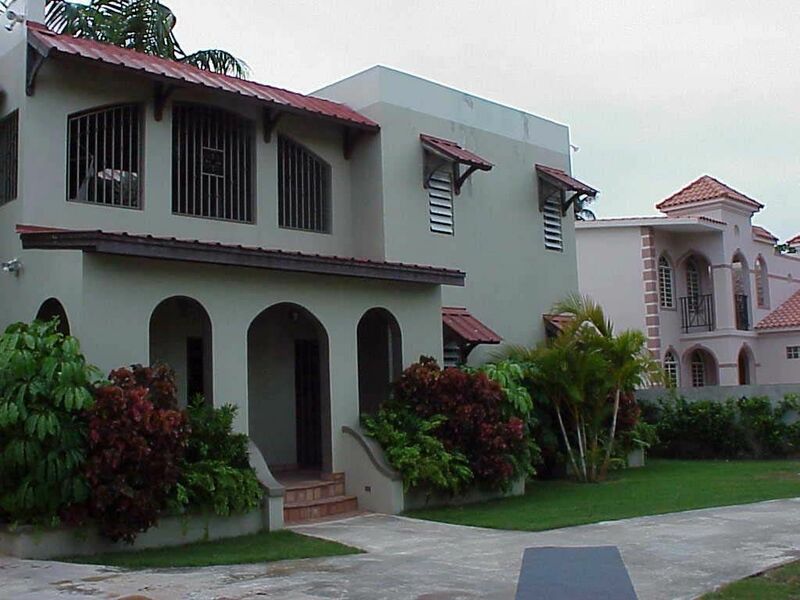 Families and couples love the open floor plan of our home, limited beach access, private areas within the house, and proximity to some of the most historical cities in Puerto Rico - not to mention the friendliest townspeople you'll ever meet on the island (most speak English). The weather is perfect, you don't need a passport to arrive, the currency is US dollars, and we have dozens of restaurants, markets, and Bohios (bars) which are safe and nearby. Easy drive to WalMart, K-Mart, Sears, Penneys, Mayaguez Airport and more. Also, it's a 2-minute drive to the nearest supermarket. Emergency Room in downtown Rincon is open 24/7. Your GPS on the phone should serve you well! The house is directly on the Corcega Beach. The water is crystal clear. Being that we're on the Caribbean side of the Island, the waves are easily managable for 'oldsters' like my husband and I, as well as our grandchildren ranging in ages from 21 to 5 year. Of course: TVs, DVD, outside speakers for music, and beach chairs are available to you. Just minutes from historic downtown Ricon. Check the map and drive to historical sites, tour the rum factory, walk through the city of Ponce, and watch the surfers do their thing at the Atlantic Ocean's best surfing beach - right in Rincon! And the local restaurants are fantastic! See our in-house guest guide for atmosphere and menu reviews. We are own Corcega Beach but due to Maria we have lost a lot of beach especially during high tide - the view is still there with many pelicans and a great view of Descheo Island. enough dishes and utensils that you don't need to use dishwasher every day if you so desire. The house was everything and more. A wonderful experience for the whole family. Child friendly. The large dining table made it a great spot for family meals while looking at the ocean. Beach is as beautiful as discribed. Easy access into Rincon. Holy hell what an awesome house. The kitchen was made for entertaining and serving people. The huge main table and patio furniture was made for party card games and trash-talking. The stereo WORKS and it sounds great with speakers inside AND out, you can switch one set off too if it's getting late. The place is stocked with beach towels, aluminum foil, a grill, ice trays, a blender and all the other things you typically have to go and buy yourself then leave behind. The central corridor has TREES growing inside, and it ads to the airiness of the place, like you're outside in paradise yet protected from the elements. The construction of the place is top-notch and does not look one bit used, very clean and well-maintained. The beds are comfortable, there is A/C in every room should you need it. The sheets are clean and you will probably get laid here. There are food/booze markets within a mile drive/walk. The beach is literally on the far side of the backyard, about 30 feet from the patio, and it's clean of natural or man-made debris. On the road you drive into the neighborhood via there is a mango stand where you can buy 10 mini mangoes for a dollar. God it's so awesome. You will not be disappointed. The house is unique and beautiful, featuring a beautiful backyard with patio furniture, spacious bedrooms, a fully stocked kitchen, a beautiful interior garden, and (best of all), perfect access to the beach right outside the back door. Lynn was extremely accommodating of our group and we honestly couldn't have had a better experience. Many thanks to Lynn and her family for sharing their home with us! Rincon has rapidly become a choice destination for vacationers and second-home builders in recent years, due to its location along Puerto Rico's unspoiled West Coast (Costa del Sol). Here, you'll enjoy miles of sandy beaches as well as the best big-wave surfing anywhere in the Atlantic. There is terrific fishing, boating, swimming, snorkeling, off-shore scuba diving, whale watching and much more available in the immediate area, along with plenty of excursion opportunities to coffee plantations, mini rain forests, the Rio Camuy Cave Park, Cabo Rojo's salt flats, Arecibo Observatory's massive radio telescope (remember the movie 'Contact?') and the biologically wondrous Phosphorescent Bay. Golfing is available 25 minutes north and gambling 25 minutes south. You can also take daytrips to Ponce and other cities of interest. Your phone GPS should work just fine.